Plaque will be installed on public benches, facing the ocean on The Asbury Park Boardwalk. Up to (3) plaques are available on each bench and are available in limited supply on a first-come-first-serve basis. In the event a plaque is damaged or stolen APCC will replace it one time at our expense. Additional loss or damage to the plaque will be the responsibility of the donor. The donor will be contacted as soon as it comes to the attention of the APCC. 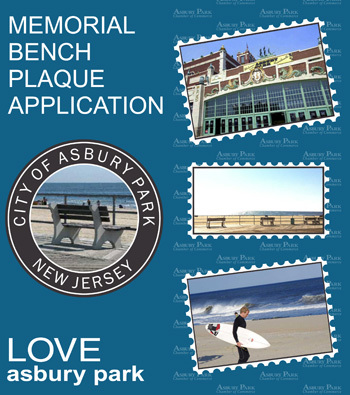 The APCC in cooperation with The City of Asbury Park will purchase, install, service and maintain the plaques for a period of 10 years. At the end of that time, the plaque may be removed and will be sent to the donor with an option to purchase a new plaque for an additional period at the prevailing rate. Thank you for your support. Funds raised by the Memorial Plaque Program are reinvested in Asbury Park and the travel, tourism and music industries that help make Asbury Park a great city to live work and play in.